Mark began performing early in life. One of six children, he realized early...that funny gets attention. It wasn't always good attention, but it was attention none the less. 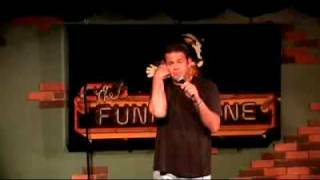 He has been performing professionally for the last thirteen years after realizing as an adult...that funny gets money.Mark started at the Funny Bone in St. Louis, worked the road for nine years, then it was off to L.A. He has been on episodes of Third Rock From the Sun, Boston Public, Days of Our Lives and The Visitor. He has also done several feature films, but you have to look quickly. He is also a regular at the Improv and The Laugh Factory in Hollywood. He has been seen on Comedy Central as well as A&E's Night at the Improv.He has done dozens of Corporate shows throughout the country. He is goofy, silly and well loved by thousands. His tales of marriage, the Marines and growing up in a large family are pricless.